If three cats take a stroll along the East River does that qualify then to join a blog hop ? Welcome to Black Cat Crossing the spooktacular Halloween hop where ghostly creativity shines. And keeping the brew stirred is Wicked Wendy and Mdm Samm. I wanted to stitch this paper pieced cat pattern by Artisana for a long time. My plan was to use this as a table runner but after seeing it in nature I might have to add a quilt sleeve. 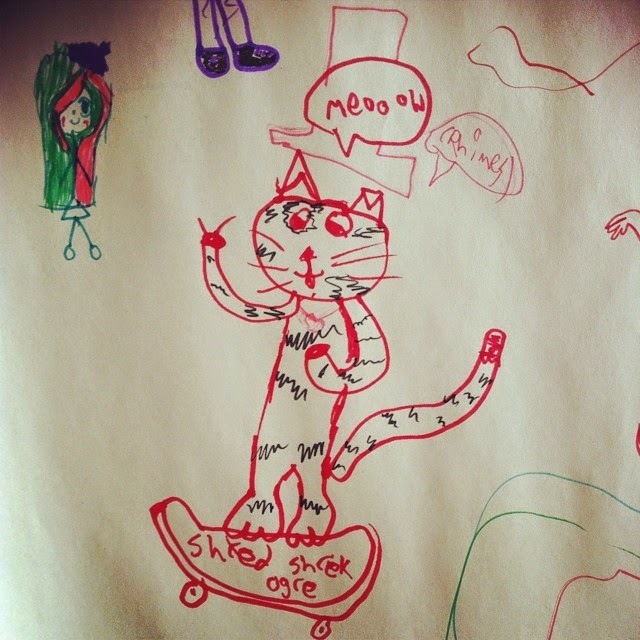 A young lady I know worked with children last summer and they drew skateboarding cats. A perfect pattern for a cat on the move. She gets a new bag to carry her art supplies. A spooky cat mug mat with wide eyes will keep you alert. I became the owner this summer of this lovely mat which was too cute not to include. My sister does lovely stitching doesn't she ? I am not that fond of bugs but this one has been very peaceful since she arrived home with me. I am not supposed to be starting new projects but when I saw this sweet pillow in the latest issue of Quilters Connection I could not resist. I thought the cushion is lovely, I could use up Halloween scraps and better yet I could easily have it finished for the hop. So pour a cup of brew and have a visit with today's other hoppers. I am lucky enough to have Girl Guide cookies for my sweet snack. You cetainly have been busy! So many great creations - yes, the crooked cats needs a hanger so it can be proudly displayed on the wall. Paper pieced kitties, sew cute! Love the tote bag and those delicious cookies, yum yum, chocolate mint, lol! Thank you for sharing. Wonderful kitties!! they look like they're ready to bounce off the quilt! Lovely mug rugs and tote as well. You have been very busy!! You have made some lovely projects. Great projects! The row of paper pieced cats is my favorite. Oh, so cute...I like all your xars...Adorable! I love your three kitties! Just great! The art supply bag will be well loved. What a adorable idea. Those cats are fabulous. Great job on all of the projects. I love your wall quilt with the paper pieced cats. It is so awesome. Thanks for sharing your creativity and being part of this blog hop. Wow, you have been busy. It's all so cool but I love that skateboard kitty bag. Oh, maybe especially the black cats paper pieced table runner. Happy Halloween! You sure have been busy! I agree, I would add a sleeve to the paper pieced quilts and hang it on the wall. Great job! Loving all your projects...you sure captured a "kitty's stare" in your mug rug. Your paper piecing looks great! Thanks for sharing! Love all the cats, really cool patterns!! Wonderful bunch of projects. I especially like your three cats wall hanging. Paper piecing is not easy, but yours looks perfect. Nice job. A great group of projects. Your kitties are wonderful. Your pieced cats are really wonderful, and the rest of your projects are a lot of fun! How wonderful that your took the little girl's drawing and turned it into a bag for her....she will be thrilled....very nice thing to do. Yep, I too like the 3 paper pieced cats !! I need some of that witches brew you've been drinking, because you've definitely been busy getting into the Halloween spirit with all these amazing projects. I love those three cats and the bag is just wickedly wonderful! What cute projects! I really like the three cats but the little drawing turned into the bag is extra special. Thanks for sharing today! You must be under an overachievers spell to have made all those great projects! Great job! Fabulous projects, can't decide if my favorite is the paper pieced cats or the bag. What a lucky girl she is for you to re-create her drawing! Love that cat on the skateboard. All of your projects look great. Your projects are all great but I am in love with the skate boarding cat. You took one art form to another seamlessly, well you know what I mean. Terrific job. Great projects and your 3 paper pieced cats will be a perfect wall hanging! I just love the skateboard cat it was a wonderful quilt along with all your other projects. Another busy lady! The skulls are very eerie and are great in your project. Always like to see children's art translated into stitchery. Great job on all your projects. Love how you did Skateboard kitty! You look like you had so much fun. Your projects are AWESOME! Those little kitties walking are perfection!!! I am not good at paper piecing...so I SO ENVY someone that can do it!!!! Wonderful entries today!!!! The fence makes a nice backdrop and the crow hanger couldn't be more perfect for this Halloween hop. Your three cats are certainly enough to qualify for this hop! My cat did complain however, that it is not a realistic picture and it must have been altered with Photoshop? She herself is a bit.....well, bigger round the middle? Loving the cat mug rug. Those eyes! And the bug rug is also amazing. Ah. They all look wonderful. Well done. Love your projects, especially the tablerunner/wall hanging. Love your paper pieced cats! Wonderful projects! Lovely projects. How excited that young lady will be to see her artwork converted to a bag. So sweet. Can't pick a favorite. Thanks for sharing. I like the bag a lot! Very nice. Love your 3 black cats walking the river! What a fun skateboard cat too! Someone is going to be very excited to see their drawing come to life. Welcome to my world of UFO's. It's just that there is way to much inspiration our her in blogland! That's my story and I'm stickin to it! What about you! LOL!! I Love the River walking Cats, so cool for this Hop!! and such a special Bag too, I bet she is going to Love it and feel very special too! Thanks for sharing all your beautiful pieces with us!! Wonderful projects and so many. Great work! Your creations are just "purrfect" for this hop. Great job! Wow, you accomplished a lot! I love the skateboarding cat bag, thank you for sharing your projects! What wonderful projects. You sure have been busy! I agree with you about your unfinished and expanded pillow project. It is too darn cute to be just a pillow. I can't wait to see how you finish yours (No pressure though!) because I know it's going to be awesome. Thanks for sharing your creations with us today,. The skateboarding cat is fabulous! She is going to adore it! Your mugrug and the wall hanging are beautiful, love the colours. Fabulous projects. I especially love the three cats quilt. Love your Bag!! So cool to use the Skkateboarding Cat picture!! She will love it! Wonderful job on all of your projects. I like the scateboarding kitty ha ha. Love your projects, I especially like the quilted spider webs on your black cat table runner. All of your projects are awesome! Wicked and wonderful! You really got into the spirit of things and stitched up a bevy of delightful projects. I'm smitten with the 3 kittens on that glorious mini - so striking and grinning at that bag made from a child's drawing. You outdid yourself with so many cute and clever ideas! Thanks so much for sharing. I think the cats should hang somewhere. Wonderful projects! Love the bag made with the child's drawing, very creative. Thanks for sharing. Cute projects. Love the bag you made from the drawing. What a great way to immortalize a child's art. Great projects. Love the paper pieced kitties-too cute to eat off of, yep, it should hang on the wall. Art bag is going to we well received, it is so cute. i love the child artwork turned into applique. how fun! Your paper pieced black cats are really cool, Frances. I really like how you put them together. Great bag for a lovely young lady. I love turning artwork into fabric art. Great job! Kid's work to quilts--great idea. Love the pp cats. Make it a wall hanging. Your projects are fun! Nice work. Your projects are just lovely. The 3 cats quilt will definitely make a nice wall hanging. What great projects -- love them all! And LOVE the idea of making one from kid's art. Adorable! Love your projects. The table runner is stunning. I would want to display it, too! Your black cat is wonderful. I love that pattern! All your projects are spooktacular and I love your new UFO. I may have to copy that one! You have so much to show that I don't know where to begin! I love the black cats on the orange. Hi!!!! Wonderful!!!! You really had a lot of fun!!!!! You are just way too clever!! Cute, cute, cute!! I couldn't resist making Linda's pillow top, either. I love that you made four for a small quilt. Gorgeous! Love your paper pieced cats! wow! You have been busy. All of your projects are fabulous! The mug rug is darling. And the art supply bag made from a child's drawing is a treasure. Your sister's spider is great, too! All of your projects really turned out wonderful. All your projects are wonderful. I want a spider web mini like the one your sister made! I really don't know which creation I like more, sooooo difficult to say, really. So wicked difficult, they are so full of creation and energy... But I think that the pic with the crow holding the skateboard cat just made me veeeerrrry creepy, LOL, that is my favo! LOVE your cats...every last hair and whisker! The first three are just absolutely spooky...yes, they would for sure be a wall hanging in my place....and that skateboard cat...what a hoot! All your projects....purrrfect! 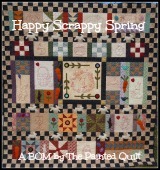 A great runner and another great beginning for using up the scraps! Spooktacular projects...love them all especially the art bag!! !! Awesome pictures, love the crow!! Thanks for the inspiration...happy stitching. Oh my goodness, what great projects you've made! Thanks for all the inspiration.